Ripple Lace Messy Bun Hat - Free Crochet Pattern - love. life. yarn. Brr…. it is super cold outside!! Here in middle TN we don’t see a lot of single digits, but lately the lows have been that cold and the wind chills in the negative numbers! It’s so cold that school has been cancelled so the kiddos don’t have to wait for the bus in this weather – I wouldn’t want to, either! Click here to buy an ad-free large print PDF of this pattern for $1.99! IMPORTANT NOTE: Ch 3 at beginning of a row does NOT count as a dc. Row 2: Ch 1, sc back loop only in each st across; turn. Repeat row 2 until piece measures 22″ from beginning, ending with a WS row. Turn ribbing and work along side of ribbing as follows. Round 1: Sc 99 sts evenly along side of ribbing, join with sl st to first sc. Round 2: Ch 3, *skip next 2 sc, dc in next sc, ch 1, dc in first skipped sc; repeat from * to end, join to turning ch with slip st. Round 3: Ch 1, sc in each st and ch-1 space; join with slip st to first sc. Round 4: Ch 3, *skip next 2 sc, FPtr in next dc 2 rows below, ch 1, dc in first skipped sc; repeat from * to end, join to turning ch with slip st.
Repeat rows 3-4 until piece measures 6 1/2″ from bottom of ribbing, ending with a Row 3. Round 1: Ch 3, *skip next 2 sc, FPtr in next dc 2 rows below, dc in first skipped sc; repeat from * to end, join to turning ch with slip st – 66 sts. Round 2: Ch 3, *dc2tog; repeat from * to end, join to turning ch with slip st – 33 sts. Round 3: Ch 3, *dc, dc2tog; repeat from * to end, join to turning ch with slip st – 22 sts. Round 4: Ch 3, *dc2tog; repeat from * to end, join to turning ch with slip st – 11 sts. 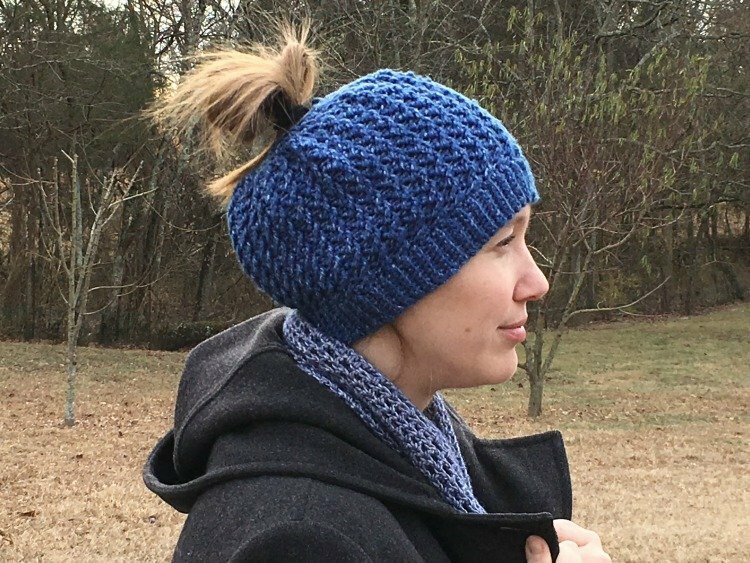 I hope you’ve enjoyed this free crochet pattern for the Ripple Lace Messy Bun Hat. 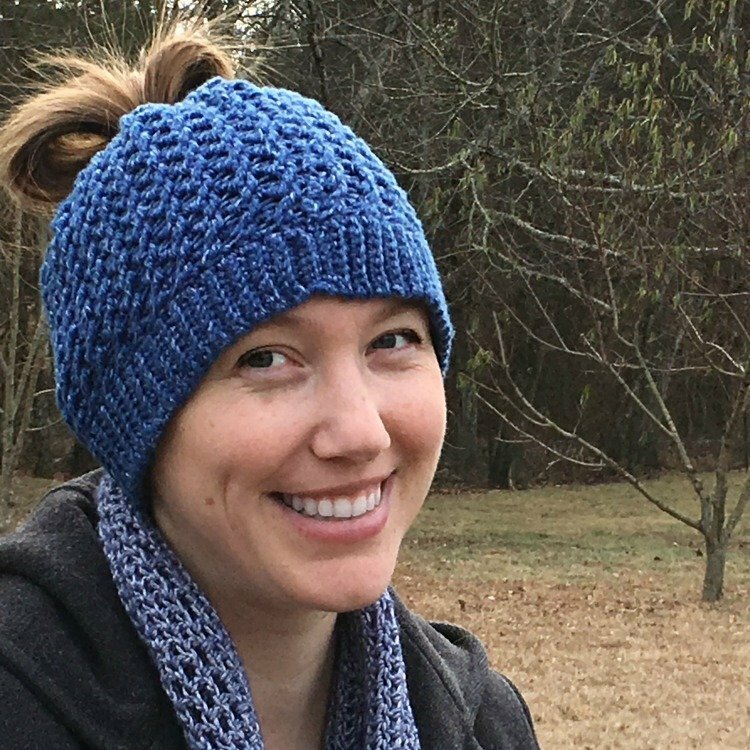 Feel free to check out my other free crochet hat patterns, including two other messy bun versions! What a pretty Messy Bun pattern. I can’t wait to do 4 for my grand and great daughters. Thank you so much for your patterns. You are so welcome! 🙂 I love sharing my designs! The video tutorial for this project should be up sometime this week. 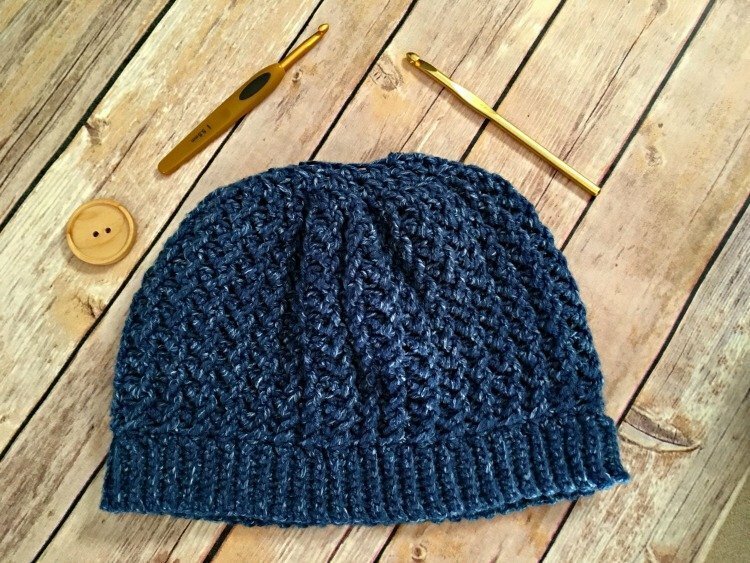 I can not find the tutorial for the Ripple Lace Messy Bun Hat, where am I missing it. I need to see how you are doing the round 3. Thank you very much it is so pretty, and I am on round 4 now. Very easy to follow. I need to make smaller than the pattern. I decrease rim size, but throws off the count. I cannot get through round 4 . I’m sorry I have not sized this for multiple sizes as I have to work each one out as I make it when it comes to the shaping of the crown. Try a smaller hook size and see if working the original pattern with that will work for the rim size. Thanks. I started again using smaller and going by pattern and still too big. Round 4 is where I am having issues. Starts ok and I think I realize now there are too many single crochets , therefore, too many stitches between fptrs . I am not experienced enough to figure out how to adjust number of stitches. I just finished this project tonight, but I closed up the top. I love the stitch! It’s so pretty! I was wondering if you have a pattern for gloves that would go with this. Making it as a gift. Thanx! I have a question regarding the Ripple Lace Messy bun. Starting with Round 2 and throughout at the end if each round it states ‘ to join to turning chain’ should it be the beginning chain.